The Southern Ocean, also known as the Great Southern Ocean, the Antarctic Ocean and the South Polar Ocean, comprises the southernmost waters of the World Ocean south of 60° S latitude. The International Hydrographic Organization has designated the Southern Ocean as an oceanic division encircling Antarctica . Geographers disagree on the Southern Ocean's northern boundary or even its existence (see below), sometimes considering the waters part of the South Pacific , South Atlantic , and Indian Oceans instead. Some scientists consider the Antarctic Convergence, an ocean zone which fluctuates seasonally, as separating the Southern Ocean from other oceans, rather than 60° S.This ocean zone is where cold, northward flowing waters from the Antarctic mix with warmer sub-Antarctic waters. The International Hydrographic Organization (IHO) regards the Southern Ocean as the fourth-largest of the five principal oceanic divisions and the latest-defined one. The IHO promulgated the decision on its existence in 2000, though many mariners have long regarded the term as traditional. The Southern Ocean appeared in the IHO's Limits of Oceans and Seas second edition (1937), disappeared from the third edition (1957), and resurfaced in the fourth edition (not formally adopted due to a number of unresolved disputes, including the lodgement of a reservation by Australia). This change reflects the importance placed by oceanographers on ocean currents. The Southern Ocean includes the Antarctic Circumpolar Current (which circulates around Antarctica), the Amundsen Sea, Bellingshausen Sea , parts of the Drake Passage , Ross Sea , Cooperation Sea, the Cosmonaut Sea, a small part of the Scotia Sea, and Weddell Sea . Its total area comprises 20,327,000 square kilometers (7,848,000 mi²). The Southern Ocean differs from the other oceans in that its largest boundary, the northern boundary, does not abut a landmass, but merges into the Atlantic, Indian and Pacific Oceans. This calls into question why geographers should consider the Southern Ocean a separate ocean, as opposed to a southward extension of the other three oceans. One reason stems from the fact that much of the water of the Southern Ocean differs from the water in the other oceans. Because of the Antarctic Circumpolar Current, that water gets transported around the Southern Ocean fairly rapidly, so that the water in the Southern Ocean south of, for example, South America, resembles the water in the Southern Ocean south of New Zealand more closely than it resembles the water in the mid-Indian Ocean. The Southern Ocean, geologically the youngest of the oceans, formed when Antarctica and South America moved apart, opening the Drake Passage , roughly 30 million years ago. The separation of the continents allowed the formation of the Antarctic Circumpolar Current. In many respects, the Southern Ocean forms the opposite of the Arctic Ocean , located on the opposite end of the globe. The second edition (1937) of the IHO's Limits of Oceans and Seas included the Southern Ocean; however, it did not appear in the third edition (1953) because of the fluctuation of its northern hydrographic limits with the seasons and because scientists felt that an ocean should be defined as "water surrounded by land" not "water encircling land". Individual member states' hydrographic offices have defined their own boundaries; the United Kingdom used the 55°S parallel. The IHO addressed the question again in a survey in 2000. Of the 68 member nations, 28 responded, and all responding members except Argentina agreed to define a new ocean. The proposal for the name Southern Ocean won 18 votes, beating the alternative Antarctic Ocean. Half of the votes supported ending the ocean at the 60 degrees south line of latitude (with no land interruptions at this latitude), with the other 14 votes cast for other definitions, mostly 50 degrees south, but a few for as far north as 35 degrees south. Other sources such as the National Geographic Society continue to show the Atlantic , Pacific and Indian Oceans as extending to Antarctica. In Australia, cartographical authorities defined the Southern Ocean as including the entire body of water between Antarctica and the south coasts of Australia and New Zealand , although New Zealand authorities do not generally follow suit. Coastal maps of Tasmania and South Australia label the sea areas as Southern Ocean, while Cape Leeuwin in Western Australia is described as the point where the Indian and Southern Oceans meet. The Southern Ocean lies in the Southern Hemisphere. It has typical depths of between 4,000 and 5,000 meters (13,000 to 16,000 ft) over most of its extent with only limited areas of shallow water. The Antarctic continental shelf appears generally narrow and unusually deep, its edge lying at depths up to 800 meters (2,600 ft), compared to a global mean of 133 meters (436 ft). Equinox to equinox in line with the sun's seasonal influence, the Antarctic ice pack fluctuates from an average minimum of 2.6 million square kilometers (1.0 million mi²) in March to about 18.8 million square kilometers (7.2 million mi²) in September, more than a sevenfold increase in area. The Antarctic Circumpolar Current moves perpetually eastward — chasing and joining itself, and at 21,000 kilometers (13,000 mi) in length — it comprises the world's longest ocean current, transporting 130 million cubic meters (4.6 billion ft³) of water per second — 100 times the flow of all the world's rivers. The Southern Ocean's greatest depth of 7,235 meters (23,737 ft) occurs at the southern end of the South Sandwich Trench, at 60°00'S, 024°W. Sea-temperatures vary from about −2 to 10 °C (28 to 50 °F). Cyclonic storms travel eastward around the continent and frequently become intense because of the temperature-contrast between ice and open ocean. The ocean-area from about latitude 40 south to the Antarctic Circle has the strongest average winds found anywhere on Earth. In winter the ocean freezes outward to 65 degrees south latitude in the Pacific sector and 55 degrees south latitude in the Atlantic sector, lowering surface temperatures well below 0 degrees Celsius; at some coastal points intense persistent drainage winds from the interior keep the shoreline ice-free throughout the winter. Icebergs can occur at any time of year throughout the ocean. Some may have drafts up to several hundred meters; smaller icebergs, iceberg fragments and sea-ice (generally 0.5 to 1 meter thick) also pose problems for ships. The deep continental shelf has a floor of glacial deposits varying widely over short distances. Sailors know latitudes from 40 to 70 degrees south as the "Roaring Forties", "Furious Fifties" and "Shrieking Sixties" due to high winds and large waves that form as winds blow around the entire globe unimpeded by any land-mass. Ship ice, especially in May to October, makes the area even more dangerous. The remoteness of the region makes sources of search and rescue scarce. Increased solar ultraviolet radiation resulting from the Antarctic ozone hole has reduced marine primary productivity (phytoplankton) by as much as 15% and has started damaging the DNA of some fish . Illegal, unreported, and unregulated fishing, especially the landing of an estimated five to six times more Patagonian toothfish than the regulated fishery, likely affects the sustainability of the stock. Long-line fishing for toothfish causes a high incidence of seabird mortality. International Whaling Commission, which prohibits commercial whaling south of 40 degrees south (south of 60 degrees south between 50 degrees and 130 degrees west). Japan regularly does not recognize this provision in regard to its whaling permit and whaling for scientific research: a Japanese fleet carries out an annual whale-hunt in the region. See Southern Ocean Whale Sanctuary. Convention for the Conservation of Antarctic Seals has limited seal-hunting. Convention on the Conservation of Antarctic Marine Living Resources regulates fishing in the region. Many nations prohibit the exploration for and the exploitation of mineral resources south of the fluctuating polar front , which lies in the middle of the Antarctic Circumpolar Current and serves as the dividing line between the very cold polar surface waters to the south and the warmer waters to the north. The Antarctic Treaty covers the portion of the globe south of sixty degrees south,it prohibits new claims to Antarctica and to all islands in the Southern Ocean. Between 1 July 1998 and 30 June 1999 fisheries landed 119,898 tonnes, of which 85% consisted of krill and 14% of Patagonian toothfish. International agreements came into force in late 1999 to reduce illegal, unreported, and unregulated fishing, which in the 1998-99 season landed five to six times more Patagonian toothfish than the regulated fishery. Major operational ports include: Rothera Station , Palmer Station , Villa Las Estrellas , Esperanza Base, Mawson Station , McMurdo Station , and offshore anchorages in Antarctica. The Southern Ocean's southernmost port operates at McMurdo Station at . Winter Quarters Bay forms a small harbor, on the southern tip of Ross Island where a floating Ice pier makes port operations possible in summer. 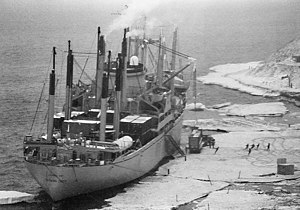 Operation Deep Freeze personnel constructed the first ice pier at McMurdo in 1973. Pyne, Stephen J.; The Ice: A Journey to Antarctica. University of Washington Press, 1986. NOTE: Despite the title, Pyne has not published a travel journal here: instead he presents a well-researched study of Antarctica's exploration, earth-sciences, icescape, esthetics, literature, and geopolitics.